A part on the outside of a spaceship that morphs, rather than requiring an astronaut to perform a risky maneuver. Plumbing pipes able to bend and flex based on the needs of the water flowing through them. Furniture that assembles itself, no screwdriver required. Buildings with the ability to repair themselves when something goes awry. 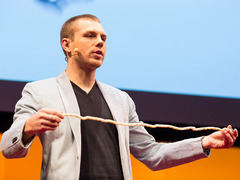 Skylar Tibbits: The emergence of "4D printing" These are just some potential applications of research being done at TED Fellow Skylar Tibbits’ Self Assembly Lab at MIT. In this lab, designers, scientists and engineers come together to work on new ways to make disordered parts become ordered — on their own, since the programming is part of the object itself. In today’s talk, give at TED University at TED2013, Tibbits introduces us to one of his most fascinating nascent ideas — what he calls “4D printing.” A collaboration between the Self-Assembly Lab and 3D printing giant Stratasys, 4D printing allows for the printing of objects that — when they have an energy force (say, touch or submersion in water) applied — transform themselves. Watch this intriguing talk to see exactly what this means. And below, see some very cool projects from Tibbits and his teams. This black strand was 3D-printed to lie flat. But when submerged in water, it folds itself into a square. Directly off the printer bed, this object has transformation embedded into it. This 3D-printed object looks like a black necklace. But when tugged, it folds to form the letters MIT. This flat, white matrix looks like it could be a potholder. But at a touch of its corners, it folds inward, as if it were alive. In this giant tumbler, the bent hexagonal pieces of a stool find each other and assemble themselves. A very cool demo from TED2012, using a model demonstrated on the microscale by the polio virus. Skylar Tibbits shows off his Biomolecular Self-Assembly kit. Revealed at TEDGlobal 2012, these flasks contain mock molecules, broken into components. As the flask is shaken, magnets allow the pieces to find their mates and become one molecule. In this demo, a pliable black substance is made to harden—then brought back to its original state. Protein strands have the ability to fold themselves. This object mimics that process. When kinetic force is applied — i.e. when it’s thrown in the air — it folds in much the same way. Watch as this MacroBot transforms before your eyes. I know that 3D printers are capturing the market in a great speed, what I dont know is that we already have 4D printers even if the 3D printers are just entering the market. Technology is really fast and advanced and this is for the sake of humanity. Pingback: Can 3D Printing Go Green? The futuristic future we imagine comes close! People excel and learn, not because they are told to, but because they want to…! Wow! Just imagine the possibilities.